Hi all. I have my second project with my Hero Arts stamp sets here. I originally thought about a set of blocks with the word Autumn on them but when I started work on them you really couldn't see the stamp images for the alpha so I had to go back to the drawing board. I painted the edges with Distress Crackle Paint in Vintage Photo as I wanted that end of summer beginning of the end feel for the block. 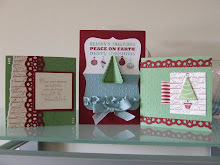 For the sides I cut 2 x 2 squares of cream card and embossed them with clear embossing powder. I used a mixture of Wild Honey and Spiced Marmalade Distress ink to colour them with Walnut Stain to ink the edges. My only additions were the "These are the Days" stamp which is an American one but I haven't got the original packaging so I'm not sure whose it is maybe Technique Tuesday and Stampin' Up papers for the top and base from a mini catalogue last year, again the name escapes me but they were very nice. I stamped the leaves again in Wild Honey/Spiced Marmalade and Walnut Stain combination and hand cut them out to sit on the top of the block. I am in love with your little block...gorgeous!!! Thanks for the inspiration and will try this over the weekend. This is such a beautiful box Sonja. It looks like I lot of work went into making it but it was well worth it.